In The 100 Season 5 premiere, we got a glimpse into what life has been like for Spacekru during the six-year time jump. Green algae diet sound good to anyone? That alone would seem to be enough to drive a person crazy, let alone being stuck with the same six companions and your own mind. In this week's episode, "Sleeping Giants," Spacekru will attempt to return to Earth, but it won't be without unexpected complications. 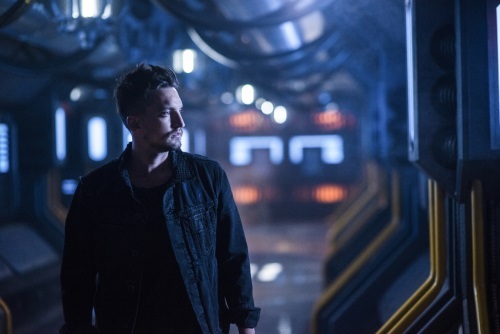 I visited The 100 set in Vancouver while the series was filming with a group of journalists and we had the opportunity to talk with Richard Harmon about playing Murphy and how his character has changed over the years and what happens next for Spacekru. Read on for edited excerpts of the conversation. How has Murphy changed over the six-year jump? I think six years in space, it’s hard to maintain a purpose. On the ground, it’s survival. In space, we figure out after awhile how to survive. You have the algae farm giving us the food. It’s not great food, but enough to live. You have to ask yourself what there is to do up there. If anyone has a hard time with a sense of direction, when there is no outside stimulus getting at him, it would be Murphy. He’s lost his way a little bit over the six years and that’s where we find him. He’s probably itching to get back down to the ground. We have to figure out why after six years, an extra year clear of when we were allowed to get back down to the ground, yet we are still not there. What are some of the dynamics of the people on the Arc? How have things shifted? Without giving away too much of their relationships that we all have up in space, six years with just that same group of six or seven people, you kind of become a family after that amount of time. But, families aren’t perfect. You fight. You have issues with each other. That’s the interesting thing to see, what our relationships are like. Everybody fights, but we’re all obviously a lot closer and a lot of the issues that we’ve had on the ship are probably in the past after six years. I’ve said this before. A lot of therapy can happen in six years, but that doesn’t mean that new qualms with each other won’t arise. We are going to have issues. Was there a dynamic that really surprised you when you read the scripts? We understand that Bellamy has taken on a leadership role and that Raven is second in command. Can you talk about those roles? Bellamy is so well-suited for that kind of position. He’s proved it time and time again. Obviously, not so well in the beginning. He was well-intentioned, but kind of did stuff in an improper way. I might have also had something to do with that in edging him in that direction. It’s like Clark said, he has to learn to lead with both his mind and his heart. I think, at the beginning of the season, you see that he has assumed the leadership and now, us, hopefully, coming back down to ground, you are going to see he has heeded that advice and now, implements that sort of system with the mind and the heart. And, Raven is such a problem solver that she’s such a great second-in-command to have. I wouldn’t even put them one and two. I would put them 1A/1B. Murphy, he doesn’t really care about that. He doesn’t really want leadership. It kind of ticks him off a little bit, but those are people who are very close to him. Is it fun for you to get something new to do every season with this show? Every year there seems to be a reset. Absolutely. It’s like an anthology series, except we have the same characters. Last year was this natural disaster. Now, this year, we have these new obstacles to overcome. It changes the way the characters get to interact with each other. Especially now that it’s six years in the future, they’ve grown up. As actors, it was a lot of fun to implement things that you can just throw into the mix. Usually, you take a while, like a full season, and you’re working little dynamics of your character in until the audience can accept it. You can’t just throw it in. But, with this season, you are able to throw things in after six years and the audience is just going to have to buy it, which I really thought was fun as an actor. I’m sure everyone else had the same kind of sentiments as I do. How has Murphy’s romantic relationship progressed? That you are going to have to wait and see. He’s a complicated guy. Six years with Murphy is a long time. Will we get peeks into what happened over the last six years, maybe in flashbacks? I believe it has been said that there will be flashbacks this season. There is a lot of stuff that could be flashbacks. So, I don’t know if every story is going to get that service. Some are more important for you to see than others. You will know a lot of what happened in our six years by alluding to it and by seeing the repercussions of the last six years has had on us, Spacekru or whoever the seven of us are. You will see the repercussions of what the last six years have done to us. Through that, I believe you will kind of get the feeling of what we have gone through. When The 100 began, it was the Grounders and the Skaikru came down and then Skaikru ended up becoming the Grounders. Now, we have these new people that are coming that are from our present day. Can you talk a little bit about what’s the changing dynamic and theme, and how does Murphy react to this new environment? Sure, like you said, we’ve come a long way from the Skaikru versus the Grounders, and us being at war with them, and kind of being on their side. Then, it become the internal struggle within the Grounder community. And, now we’ve moved on to what has to be all the people in the bunker, all the Grounders, I’m assuming, must have come together a little bit in that time and put aside their previous allegiances to their specific clans. So, now you have the prison ship coming down. I’ve been barred from saying anything about that. I think that’s for the best because when you see these guys and what they are up to – and not just that, but their backstory and not just where they come from, cause you know where they come from, but what they’ve been through and all that – it’s a pretty interesting story and whether it’s a fight between us or whatever it is, bad/good. I think what we’ve done on this show is that this nice little gray area. No one group is all just bad or all good. There are individuals in that group. You are going to get to know a lot of great, great new characters. – just phenomenal actors that we’ve brought in this season – that have really upped all of our games. Murphy has always skirted that fine line between good and evil. Are we going to get to see him explore the darker side of his personality moving forward? I certainly hope so. That’s always been my hope. I loved the redemption arc, and I love all that. It’s like you said, he’s never going to be evil. You can say in Season 1 he was a pretty bad person, but I think he is never going to be truly evil. With everything going on, with all the characters, we’re all going to have to ride that line again being back on Earth, doing what might not be morally correct, but what is correct for you and your people. And for Murphy, sometimes its about himself and not his people. We’ll see Murphy be Murphy. You are not going to take that out of the kid. You’ve discussed the internal conflicts and environment in the ship, but have there been any external factors that affected them? In the ship, no. That’s what is so interesting about it is we haven’t. It’s been the same thing. It’s just living for the next day. You wake up, you do the same thing, you go to bed, you wake up, you go to bed and you wake up for six years. That’s enough to drive anyone nuts, let alone Murphy, who is right on the point of losing it at any possible moment. That was what was so interesting about our storyline. Everyone else has the external factors over the six years. We have just our own minds, which are our own worst enemy. Murphy and Raven had a very contentious relationship. Towards the end of last season, they really came together and had an understanding. How has that evolved over the six years? I think there’s an incredible deal of respect between those two characters. Some of my favorite scenes I have ever done on the show have been between me and Lindsey. Lindsey is unbelievable. She’s going to be a complete star. When you have the opportunity to work with someone like that, I really take advantage of that and enjoy working with her. The more I get with her, the better in my opinion. What is the biggest challenge for Spacekru? Once we come down, if we come down, yes, if we come down, I believe it’s everything. The relationships we made on the Arc will make us stronger. It will also tear us apart by giving us weaknesses by having the people that we care about there. As we’ve shown with the ground, it will take what you love and it will use it against you. Like you said, it’s going to be a little bit of everything. There’s going to be the external forces that are going to affect us. It’s about how we stick together, or even when we are apart, you’ll see if we try and come back together and how much we care about one another, and how much that affects our ability to survive, is having these loved ones. I always said Murphy has never been more at a risk than when he fell in love with Emori. I think if he was always by himself, I don’t think this guy would ever die. He would die at the ripe old age of 87, with a crap ton of battle scars on him, but, somehow, he would have lived. With the love in his life, I think of everyone, it makes you vulnerable. It makes you weak in a good way. There is nothing more to life than love, but it will be what kills you. It always is. The 100 Season 5 airs Tuesdays on the CW.